The process of storage and moving can be boring and time consuming. Make moving and storing easy by using our alternative to the common storage shed. 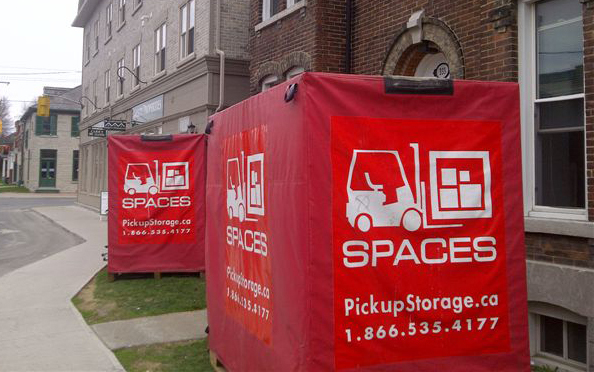 We deliver the best solution for your moving and storage needs in the form of our portable storage container. We will deliver our conveniently sized storage and moving vaults right to your door. Our portable storage vaults make moving and storage easy and secure. Whether you have plans to move across town or doing some spring cleaning in your garage or attic, Space Storage has a simple cost effective process that makes it easy for you. A lot of moving companies will quote you one price and then change that price after the job is done. Not us. At Spaces the price we quote is the price you pay. There are no hidden fees or charges just straight forward affordable prices. One of the best features of our portable storage containers is that you don’t have to work around anyone else’s schedule. We can drop the container where you want, whether it be to your home, work, or cottage, where you can take your time and pack at your leisure. There are no mover’s schedules to work around and no hours of operation like at a common storage facility. Once you are finished packing the storage container we will move it to our secure climate controlled warehouse until you are ready for us to return your belongings. If you are planning a move or just looking for a place to store your items, we can help. Give us a call or fill out the contact form with your phone number and we will contact you within 1 business day! Learn for yourself just how well our portable storage solution can meet your moving or storage needs.